Happy Holidays! I got you a list of 2013’s best games. Dragon Commander took the decision making present in Mass Effect, the RTS and multiplayer elements of Starcraft, the game board from Risk, slapped them all together and then made the main character a Dragon. A Dragon with a jetpack. The result is something of a sloppy mess at times. Characters talk in giant walls of text, and the game board has some confusing elements. When these things work though, its a big fun mess. When your army starts to lose a battle, its thrilling to descend into action as a Dragon and raze the entire enemy force to the ground. Near the end I was capable of winning entire battles on my own, using powers I’d unlocked through the course of the game. Dragon Commander ultimately makes the list because of how well the game emphasizes your role off the battlefield. In between turns on the board, you’ll meet with a council of races to make important political decisions. I dare you to find me another game this year where an undead skeleton politician will condemn you for supporting gay marriage. I always had to struggle through older Tomb Raider games. The environments were always interesting, but I found traversing them to be a clumsy chore. Its impossible to count how many awkward jumps and somersaults I’ve made Lara do trying to get around a rock, and god help me if I had to shoot something. Crystal Dynamics must’ve shared similar experiences when they decided to reboot the franchise, because travelling around the island of Yamatai was way more fun. There’s an excitement to traversal I’ve never experienced in any previous Tomb Raider installment. I’m not just jumping off ledges, I’m leaping off ledges and stabbing into rocks with a climbing hook. I could just slide down a rope, sure, or I could get out a mechanical pulley and zoom across a chasm. Everything about Tomb Raider is just mechanically smart. Taking cover is simple as standing near a low wall. Sneak kills with the climbing pick are ruthless and simple to execute. Even the quicktime events are handled well (with the notable exception of one very lengthy wolf kill). Tomb Raider also features the best bow I’ve ever used in a game. 8. 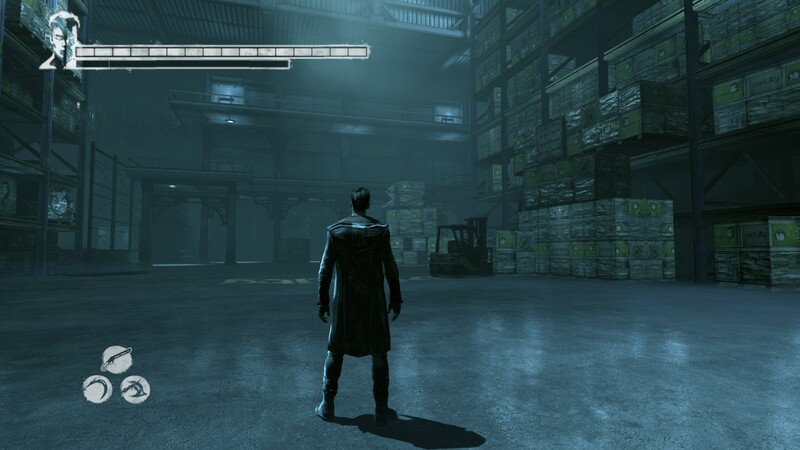 DmC: Devil May Cry. I’ve always loved the Devil May Cry series, but there are some moments from the franchise that are difficult to defend. A quick youtube search of “fill your dark soul with light” ought to present such a moment. When I heard Ninja Theory would be rebooting the franchise, I was initially hesitant. The idea of a new developer taking over filled me with a lot of doubt the series would still retain its high-octane style. Ends up I had no reason to worry, because DmC is incredible. It preserves all the wild action and bare knuckle difficulty I’ve come to expect from a game carrying the DMC name. 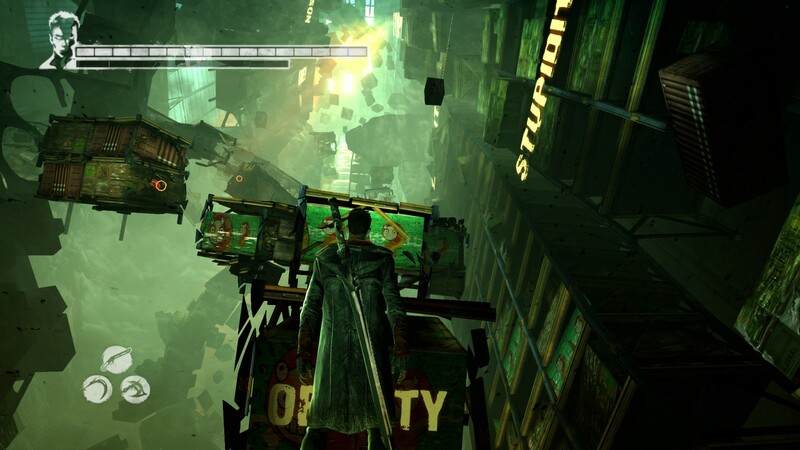 The new mobility options of either pulling Dante to a target or pulling the target to Dante added depth to both the combat and level design. Ninja Theory also somehow took a series known for an insane, crazy, and sometimes insensible storyline, and made something cohesive out of it. There’s a dynamic between the characters I really grew to appreciate, where Dante was the loud, brash, arrogant egotist, and Vergil was the calm, cool, intelligent egotist. The concept of Limbo, a world running parallel to our own, also expanded the universe in a big way. It’s a concept that simultaneously created tension in the story and allowed the level design to go all kinds of Salvador Dali and M.C. Escher. I think it was around the time I flew through the air of steelport listening to “Opposites attract,” while telekinetically carrying a pedestrian over my head that I realized I was having more fun than should legally be allowed. Saints Row 4 lifted limitations of the sandbox genre I didn’t realize existed. Saints Row 4 might have more in common with a superhero game at this point then a sandbox game. As I leapt over buildings and threw balls of fire, I had to remind myself somewhere down there were cars. Cars I could get into if I really wanted to. The thought process usually ended with me telekinetically throwing the car across the world instead. Saints Row 4 is a blast outside of its mechanics as well. The characters have become downright endearing to me over the Saints Row series, and I loved returning to see the casts antics once more. There’s a reverent love for the characters and the series history present in the witty writing. The whole thing left me with a big, goofy grin, and its easily the most I laughed at a game all year. The colors! So many colors! Rayman Legends is beautiful, and a solid platformer to boot. Did you play Rayman Origins? If you did, this is a better version of everything in there. If you didn’t, good news! Half of Origins is in Legends anyway. The platforming and artistic design would be enough to stand on their own, but Rayman Legends goes above and beyond with the exceptional music levels that mark the end of each world. Mariachi Eye of the Tiger? Yes please. Throw in the drop-in, drop-out multiplayer and the fact you can have up to five people running around on the Wii U, and you’ve got yourself a party. (You do want the Wii U one, if you have the choice). Gone Home is something of a masterpiece. Gone Home uses techniques typically employed by the horror genre, but uses them to scare you in the same way we scare ourselves every day. It isn’t a fear of monsters roaming the halls, or ghosts lingering in the corner of your eye. It’s coming home and swearing you left that light on this morning. It’s hearing a bump in the middle of the night and telling yourself nothing is in the house, no one could be in the house, because you locked the deadbolt when you came in. Of course you did. But just to be safe... maybe you ought to run downstairs and take a peek. Gone Home presents you with a similar situation, where upon returning from a study abroad program you find your home deserted, with only a cryptic note from your sister tacked on the door. Gone Home then lets your imagination drive a panicked search through the house to uncover the truth. 4. Call of Juarez: Gunslinger. Not since Sunset Riders have I had such a good time as a cowboy (Sorry, John Marston). Silas Greaves is one badass bounty hunter... or so he’d have you believe. Gunslinger opens with Silas sitting down at a saloon and sharing his stories of shootouts and showdowns with the local crowd. As he begins each tale, you’ll find yourself in control of past Silas, playing through the memory as he recites it. At the crux of the game is not just Silas Greaves, but his poor memory of events. He forgets, embellishes, backtracks, and loses his train of thought. Then he finds it again, but its a different train altogether. Every time it happens, the world you inhabit alters to reflect his own twisted narrative. Houses appear out of the ground. The weather becomes foggy. Or your location changes entirely. Where the game packs a surprising narrative punch is when it starts to delve into why Silas’ memory is so shoddy, and what happened to make him the confused yet boastful man he is. Gunslinger is a genius act of narrative driving gameplay. I’m glad I gave it a chance this year. I also have to mention the incredible Story of Silas Greaves song, which manages to convey the tone, narrative, and even mechanics within Gunslinger. 3. The Wolf Among Us. This is a tricky one to discuss. Though I typically have little concern for spoilers, the story of Wolf Among Us is the experience. Here’s the set-up; all the fables and fairy-tales you know live amongst us in New York. In Wolf Among Us, you play as the Big Bad Wolf, who’s in charge of keeping the peace and hiding the true nature of all the fables living in the city. Things aren’t ever perfect, it seems. Strife and conflict exists throughout fabletown all the time, so Bigby’s got his hands full. Murder is a new one for the people of Fabletown though. The opening makes it clear that Fables don’t die easy, so when they do start turning up dead Bigby’s job gets complicated. I played through Episode 1 of Wolf Among Us in a single sitting, and my only frustration was that I had no Episode 2 to start. I found Bigby to be remarkably complex, and the fact his fabled history as the bad guy of fairy tales informed part of his character made him all the more fascinating. I also derived a certain enjoyment from trying to guess which Fable a character was from before being told. As with previous Telltale games, this is all about story. There aren’t many mechanics to discuss short of selecting responses and the occasional quick-time event, but they’re all executed perfectly. There was never a time I felt lost or confused. In fact, I often felt rewarded for my attempts to explore, as it often led to finding some out-of-place clues. One quick aside to Telltale, if I may. Not cool, Telltale. Not cool. Here I am waiting for episode 2 of Wolf Among Us, then you go and launch a new game. Then announce two more. 2. Super Mario 3D World. Nintendo may have had a weak start with the Wii U, but Super Mario 3D World is proof they shouldn’t be counted out yet. I completely lost myself in 3D World. My eyes were filled with nothing but stars and coins. The change to a 3D space made multiplayer infinitely better than past Mario iterations, as it becomes not as common to accidentally kill your friends. “Not as common,” is an important qualifier, mind you. When four people need to land on one small platform at the same time, someone’s gonna die. The real joy in Mario World is the level design. You’ll be doing all sorts of wall jumping (and wall climbing too, thanks to the addition of the cat suit). There’s also some awesome dinosaur surfing that takes place. At first none of this is particularly demanding. I even finished the game feeling a little underwhelmed, like I’d never truly been challenged. Then I returned to my save file and discovered an entirely new world, wrought with much more difficult levels. When I conquered that world and yet another appeared, I felt content that Super Mario was indeed everything and more I could’ve wanted from a Wii U Mario title. There are games, many games, where I wish I could wipe my memory and play them again. I want to relieve the surprise, the suspense, the unknowing. Infinite is the first game to leave me with the opposite feeling. Finishing it was only the beginning. Upon concluding the game, I proceeded to do a google search for “Many Worlds Theory.” Eight hours later I felt like I had a pretty good grasp on what I experienced, but I played through the game one more time, just to make sure. There are certainly criticisms I could level against Bioshock Infinite. In fact, I have leveled criticisms in conversation with friends. None of those critiques existed in the midst of the experience, however. They came afterwards, after much retrospection and consideration. I spent much of 2013 thinking, talking and theorizing about BioShock Infinite. They are criticisms that exist not because I found the game poor, but because I desire for it to be even better. The World of Columbia enraptured me completely. It takes quite some time before combat breaks out in Infinite, but I didn’t mind at all. I took my time walking around, taking in the sights, and lived in the world. There’s an amazing beauty present in Columbia, and the beauty is suddenly brought to a halt by a moment of intense violence and irreverent, unabashed racism. Its a harsh juxtaposition, but one that announces loud and clear the tone and pacing, and quickly illustrates everything is not alright in paradise. The story comes to a conclusion with a similar abruptness, and it left me with a thousand questions. They weren’t entirely unanswered, however. It did leave me clues. A path to discover more for myself. My analytical skills went to work, and they didn’t stop for months. Bioshock Infinite is the only game this year I felt passionate enough about to study Quantum Theory. And after a statement like that, there’s no way I could make anything else my Game of the Year. The following games once held a spot on the list, but were eventually ousted. I felt they still deserved recognition for their efforts. Reason for exclusion: Although I found the narrative elements of Papers, Please exceptional, the mechanics reminded me too much of previous jobs I’ve had pushing paper. Bad flashbacks bumped it off the list. Reason for exclusion: An amazing game to play online and stylistic as hell, but less fun to play alone. If there’s no one around to play it with, I forget its even on my steam list. Sorry Monaco. Reason for exclusion: I enjoy everything Rogue Legacy has to offer, and I’m happy to have backed it on kickstarter. It started high on my list, but I continued to find other games I felt more passionate about. In the end, Rogue Legacy fell off the list, one number at a time. Reason for exclusion: Playing the Half Life 2 mod ruined The Stanley Parable’s chances at being on the list. I already had a good idea of what to expect after playing the original, and several of the endings actually do play out in a similar fashion. Stanley Parable still succeeded in surprising me anyway with a few wild cards, but not enough to cement it a spot on the list.